Printing is a process for reproducing text and images, typically in modern times with ink on paper using a printing press. The various forms of printing associated with art include the ancient form of woodblock printing, etching and engraving from the 16th century, lithography from the 18th century and in the 20th century, screen printing, laser printing, inkjet and digital printing. 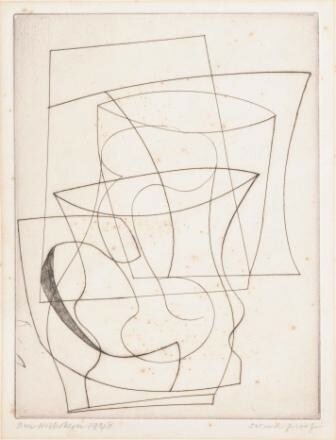 A Ben Nicholson 1948 drypoint etching sold for £5,200 (FS9/425). Chromolithography became the most successful of several methods of colour printing developed during the 19th century, with George Baxter being credited with establishing the first viable method of colour printing during the Victorian period. The Baxter views of the 1851 Great Exhibition and The Crystal Palace were among the first really commercial Victorian prints. The etching process uses acid to cut into an unprotected metal surface and this form of printing was used by such luminaries as Rembrandt, Whistler, Tissot, Nevinson and the popular marine artist William Lionel Wyllie. Henry Moore used lithography and etching for printing purposes; as too did Joan Miro, a version of whose image entitled Aidez L'Espagne was sold in our antiquarian book sale in August 2012 for £900. We were recently instructed to sell a collection of rare prints belonging to the French explorer and collector Robert Hottot (1884-1939) whose interest in travel and the exotic was inspired by his wealthy uncle, Dr Ernest Hottot. Robert Hottot was a personal friend of Raoul Dufy, Max Jacob and James Emile Laboureur and among the collection was a rare group of etching by Laboureur, which generated huge interests worldwide and sold for a total in excess of £15,000. A rare 1948 drypoint etching by Ben Nicholson, showing linear form in two dimensions but also evoking three dimensions through a number of overlapping perspectives, in the second proof state, fetched £5,200 in our salerooms. The artist Ben Nicholson (1894-1982) was born in Denham, Buckinghamshire, and attended the Slade School of Art in 1910-11. In 1922, he had his first solo exhibition at the Adelphi Gallery, London and soon after entered a period of abstract painting influenced by Cubism and by 1927, further inspired by Rousseau and early Folk Art, he had evolved a primitive style. Nicholson met Mondrian and Picasso who both had influences on his work. In 1939, he moved to St Ives with his wife, the sculptor Barbara Hepworth. They initially stayed with Adrian Stokes in Carbis Bay. Building on his Cubist influences, Nicholson now entered a period of painting landscapes and coloured abstract reliefs, and then linear abstract painting. He joined the St Ives Society in 1943 and in 1949 was a founder member of The Penwith Society. The etching here reflects those Cubist influences in terms of examining three-dimensional linear space through the medium of the two-dimensional flat surface of the paper.